Early Saturday morning at 12:45 A.M., the Spokane Fire Department responded to a report of a structure fire in the 300 block of W. Nora. Engine 3 from their neighborhood station location of Indiana and Ash was first to arrive and found a storage shed well involved in fire. A quick stretch of preconnected hose was completed as well as a water supply from the nearest hydrant, this allowed the fire crews to knock down the fire in less than 10 minutes. Heavy fire and smoke damage was found throughout the interior of the shed. Additional fire crews were used to protect any exposures that surrounded the shed. This included a nearby dwelling and business. As a result of this action, the fire did not extend beyond the shed. Some overhead power lines also received some heat damage. The cause is under investigation by the Spokane Fire Department Special Investigation Unit. Crews remained on scene throughout the night assisting the investigation effort. Heavy fire damage to the shed structure and contents within. At 9:50 AM, Tuesday, June 11th, the Spokane Fire Department responded to a reported detached garage fire at 312 S. Ray Street, on Spokane’s lower south hill. Enroute, crews reported a large smoke column visible. The first crews on scene reported a 20’ X 20’ wood framed, detached garage fully involved in fire, with three adjacent detached garages beginning to catch fire from radiant heat exposure. Additionally, an exposed, 60’ fir tree and a power pole were on fire, with the tree scattering hot embers on a weeded lot, starting the weeds and brush on fire. Electrical wires from the power pole burned through and dropped to the ground causing an additional hazard to the firefighters. Multiple fire crews extended hose leads to extinguish the numerous fires. In all, 5 engines, 1 ladder truck, 1 rescue truck and 2 battalion chiefs worked at this incident, and had the majority of fire extinguished within 10 minutes of arriving on scene. Crews remained on scene for an additional 1-2 hours overhauling the burned structures and completing extinguishment. There were no injuries reported to civilians or firefighters. Electrical power to the entire block was disrupted until Avista crews were able to gain access to the damaged power pole and complete repairs. 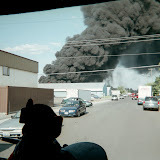 This fire was near the eastbound Thor/Freya exit off I-90, which caused significant traffic congestion both on 3rd Avenue as well as eastbound I-90. SPD and WDOT assisted in rerouting and managing traffic until fire crews could clear 3rd Avenue. The cause of the fire is currently under investigation by an investigator with the Spokane Fire Department’s Special Investigation Unit. No vehicles were damaged in the fire, however, the main fire building and its contents were completely destroyed. The exposed garages sustained primarily exterior structural damage, with minor smoke/water damage to contents. Total dollar loss is estimated at $30,000. On June 11,2013 at 11:04 6 Companies of Spokane Firefighters, 1 Senior ladder, 1 Pumper Ladder, 3 Engines and 1 Heavy Rescue under the direction of Battalion Chiefs Donahoe and Moline were dispatched to a working basement fire at 827 West Spofford. E-3 from the West Central neighborhood was the first company on scene and reported a basement fire in a 2 story home. A quick interior attack of the fire in the basement was performed while other companies searched the 3 floors of the home for occupants, ventilated the structure and checked for extension of the fire. The fire was declared knocked down within 20 minutes. All 5 occupants and 3 dogs were accounted for and are being assisted by the Red Cross and neighbors at this time. The fire is under investigation by the Fire Department’s Special Investigation Unit. There is extensive fire and smoke damage to the basement along with smoke damage to the 1st and 2nd floor. The Electrical and natural gas has been shut off by Avista until electrical repairs can be made along with structural repair.